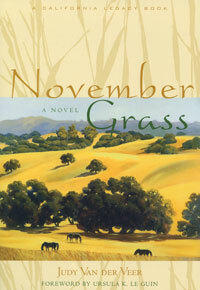 November Grass, written by Judy Van der Veer, first printing 1940. “…nothing can happen it it…” –really? what about the floating plastic trash islands? Exxon? BP? Yes, something can happen to the Oceans–and apparently it’s not much on the positive side. It is a beautiful cover. the scene reminds me of the Santa Ynez Valley hills around Los Alamos along Highway 1. Another great interpreter of those hills, trees, and light: Eyvind Earle. I love the cover on that book, Anni. Of course, the author probably did not live long enough to see what we humans CAN do to the ocean. « Asphalt, Sandstone, Pacific, Vapor, Sky.